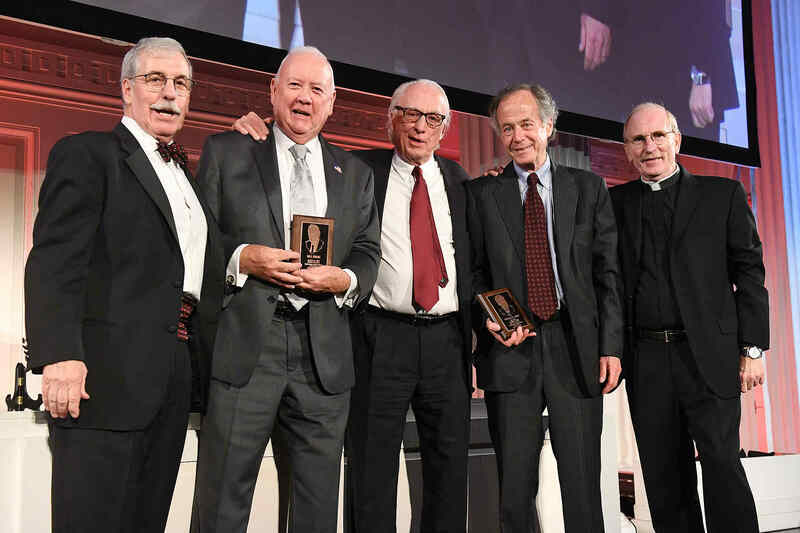 Bill J. Burke ’68 was inducted to the Fordham Athletics Hall of Fame for football on Saturday, April 22, 2017 at the inaugural Fordham Athletics Gala. Read more. James Normile ’73 has been appointed partner at Katten Muchin Rosenman. Robert Cypher ’79 has been appointed judge in the Rye City Court. Suzanne Marquard ’79 has recently received the EQUUS Foundation Humanitarian award for her work with GallopNYC and other equine programs. Read more. Michael J. McNamara ’83 will become president of New York County Lawyers Association (NYCLA) on Thursday, May 25, 2017. Vincent Gentile ’85 has announced his bid for Brooklyn district attorney. Gentile has served as a councilman for Brooklyn since 2003, spent 11 years working in the Queens District Attorney’s office, and served in the New York State Senate from 1996 to 2002. Amelia “Amy” Klein ’89 has recently joined Direct Retirement Solutions as vice president and general counsel. Read more. John F. State ’89 led a team that has received the “Refinancing Deal of the Year (Under $250 Million)” award by The M&A Advisor. He is currently a partner at Cullen and Dykman in the firm’s banking, real estate, and corporate groups. Hon. Peter Nesvold ’93 has joined the adjunct faculty at Binghamton University’s School of Management. He will begin teaching an undergraduate course on mergers and acquisitions. Christian Zebicoff ’93 has been appointed partner at Romer Debbas and will be managing the firm’s trust and estates and elderly law practice. Paul Andre ’96 has been named co-chair of the intellectual property practice at Kramer Levin Naftalis & Frankel. Catriona Morgan ’97 has joined Katten Muchin Rosenman as special counsel. Maria Scheuring Elbert ’98 has been named “Pro Bono Attorney of the Month” by the Suffolk Country Bar. Jeffrey A. Meckler ’98 has been appointed to vice chairman of Intec Pharma’s Board of Directors. Read more. Mauro Viskovic ’00 has joined the firm Meltzer, Lippe, Breitstone & Goldstein, LLP as counsel in its office in Mineola, New York. Mike Hartmere ’01 joins JND Legal Administration as vice president of operations, class action services. Read more. Gavin White ’01 joined the firm Wilson Elser as of counsel in their Miami office. Tom Basile ’02 has written and published a new book called Tough Sell: Fighting the Media War in Iraq. Noel R. Garcia ’03 has been appointed to a five-year term as administrative law judge for the NYC Office of Administrative Trials and Hearings. Joe Gim ’03 began a new position in the Nassau County District Attorney’s Office as a senior assistant district attorney in the public integrity unit. Jill R. Cohen ’05 has been appointed partner at Eckert Seamans. She divides her practice between complex commercial litigation and employment litigation. Rebecca Sanin ’06 will be the new leader of the Health and Welfare Council of Long Island. Read more. Scott Smedresman ’07 has been promoted to partner at McCarter & English in the firm’s corporate, securities, and business transactions group. Chase D’Agostino ’08 has been appointed executive director of corporate solutions at Quislex, an industry-leading provider of innovative legal services. Jon Cipriani ’08 and his wife have welcomed their first baby. James Creedon ’09 was selected to run in the Grand-to-Grand Ultra, a 170-mile, 6-day, self-supported stage race on foot through the Grand Canyon in September. He is running to call attention to the needs of transitioning veterans and to raise funds for the charitable organization GallantFew. Jeffrey Cunningham ’10 has joined the firm London Fischer in its New York City office. Matthew Girard Dobleman ’13 and Chelsea Brooke Hollingsworth were married on March 10, 2017, at Corpus Christi Catholic Church in Celebration, Florida. They are both employed at Mayer Brown in New York City. Stanley Montfort ’13 joins the firm LG Fairmont Group, one of the fastest growing tech-driven real estate brokerage firms in New York. Mary Gibbons ’15 has joined Brooklyn Defender Services as a staff attorney in its family defense practice. Grace Nam ’15 has been appointed assistant regional attorney for the New York State Department of Environmental Conservation.